Business is never static, and an area which often reflects this is pricing. Be savvy by knowing when a price hike is in order and when to bring it down, while maintaining quality and retaining your best customers. James Schramko here, with a news update from Manila. Today’s tip is going to help you make more profit in your business with one simple change. So what we do every 12 weeks is sit down with the team and we go through all of our sales. And we have a look at what’s selling and what’s not selling. We also have a look at how our capacity is to keep up with demand. So as a result, we make changes. We ask the big question: Is this the right price for this package anymore? And sometimes the answer is no. Sometimes we need to put the price up, and sometimes we put the price down. I’m going to show you how we approach that. In one case we put the price up on our article pack. We sell 10 articles at a time, but they’ve been so popular because the price was just a little bit too low in the marketplace. Our quality’s very high and our price was very low, causing a surge in orders. So we’ve made that small adjustment. We’ve only increased the price by $10 per pack, but here’s what happens. People who have already got a recurring monthly order stay on the old price. That is a loyalty lock-in. And the loyalty lock-in means that people no longer have to worry about a price increase because as long as they stay on the old price it stays at the low price. People coming in to the new price will stay on the current price. If it goes up again, they’ll be protected at that price. Now if you put the price down, which we’ve done on two of our other packages, what I generally do is anyone on a subscription, I reflect a lower price so that they’re not disadvantaged. Because I’ve long thought that banks and telephone companies rip off their best customers and reward their new customers by giving better deals to new people than old customers. And that doesn’t make sense to me. So what we’ve done with our podcast image pack is we’ve reduced the price. We’ve made it more affordable for people to get handcrafted images. 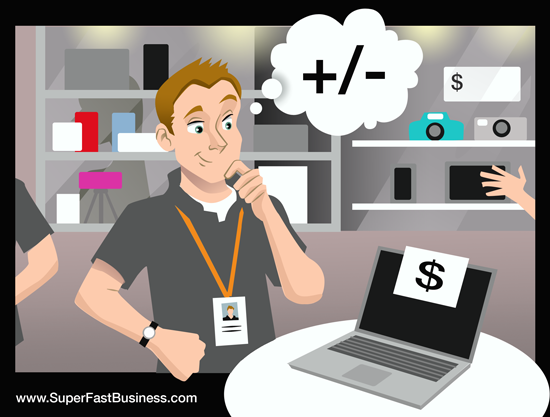 The images you see on SuperFastBusiness take around four or five hours each to hand-illustrate. And I want other authors to be able to get access to that. Also, our publishing packs. We’ve reduced the price by $100 each on our podcasting and our video editing packs. Which means that authors like you can create content, audio and video, and you can have our team edit them and publish them to the website so you don’t have to get bogged down in the stuff that doesn’t pay you as well. So our publisher packs have been really successful. And how did we determine that this is what needs to happen? We spoke to our current package customers and said, “What do you love about the pack?” and “What would make it better?” And in some cases they said, “It would be great if it was more affordable, I could do more.” And that’s what we’ve done. Could your prices use a change? So check out our publisher packs, check out our podcasting packs, and check out our article packs on SuperFastBusiness.com. I hope that this has been useful to you. Your action step is to review the products that you’re selling, and sit down with your team and your customers and decide, is this the most appropriate price for the package now? And if you do have recurring billing and you put the price up, keep the old price if you possibly can for your existing members as a loyalty reward. And if you do put the price down, remember to put it down for everybody so that they all feel loved. I’m James Schramko, I’ll update you again soon. Take care. For more effective business strategies, join SuperFastBusiness Membership.